Tynecastle Basketball in Basketball Scotland Final! The Senior Boys team this year is going from strength to strength and have reached the final of Basketball Scotland’s Open Boys Plate Competition after a challenging and very competitive run of games in the last two months. The semi-final against a very strong and physical North Inch Community Campus team was held at Grangemouth Sports Complex on Tuesday 10 March. The final score was 69 – 48 with top points scorer Ibraima scoring 37 of these. The Plate final against Dumfries Academy will take place on Tuesday 24 March at Grangemouth Sports Complex. Please find below the range of active schools extra-curricular activities (including three new clubs!) 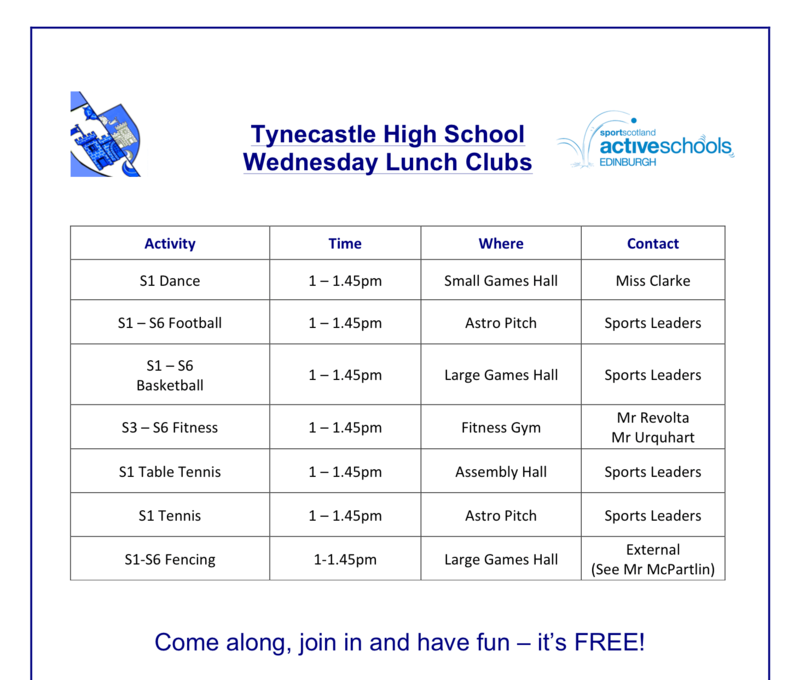 that you can get involved in at Tynecastle either after school or during Wednesday lunch times. Better yet – they are all FREE! There will be a volleyball coach coming into school to do 3 training sessions on the following 3 Tuesdays – 17th March, 24th March and 31st March from 4.45pm – 6pm. The sessions will be delivered by a Volleyball Coach from the NUVOC club in Edinburgh. This session is open to all students. See Mr Aitchison for more info. To register for a club you can simply turn up or see Pam Brown our Active Schools Coordinator or any member of PE staff for more information. PE kit must be worn for clubs.